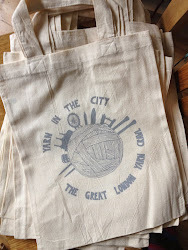 Yarn in the City: The Great London Yarn Crawl: Ready for #GLYC2015? Your charity knits are wonderful! We in Portland, Oregon are having our Rose City Yarn Crawl at this time...an annual event...perhaps you would like to take a look. All the shops have their own pattern also for crochet and for knits. 5 days, March 5 - 8. Can be found on Ravelry.com Two patterns for all to crochet and knit...we wear the Mystery Crochet and the Mystery Knit patterns on our crawl. Thanks for the wonderful idea bobbiliz! We know about the Rose City Yarn Crawl and it looks like you guys all have an amazing time! Happy knitting! Please have a look on my site bt customer services number. Awesome post about "Ready for #GLYC2015?" Your blog are superb, i read your fully blog. this is awesome. Anime Battle has returned with 17 beautiful new characters, each one beautiful and powerful. The biggest surprise in this Anime Battle 2.2 release is the addition of the Goku, Vegeta and Gotenks, also known as the main character, in the Dragon Ball Z series to the game. Anime Battle, with a total of 75 playable characters as well as multiple bosses, is the most comprehensive online combat game on the market.